Oooh those sound really good! Thanks for sharing your recipes. I make your black beans & rice with corn salsa quite often. My family loves it! Yum. Thank you for sharing! Off to make salads…. Thanks for sharing the recipes. I’ll try them out this week…perfect for a heatwave! Oooh, these sound delicious! Thanks for sharing. I’m going to send my husband a link here, since he’s stuck at home in the middle of a heatwave, the poor boy. Ca’t wait to sample your salads! Thank you for sharing them – and for the tip on the Polanski film, I’ve been so curious. MMmmm….thanks for sharing, these look lovely! This is great! I’ve been thinking of making weekly salad recipe posts, since I’m eating a lot of salads these days and the season is here. We could start a movement! You know I’m for recipe testing! great recipes! saw the polanski film, it WAS amazing…and rosemary’s baby is free on demand now too. YUM! I saw this when it came up on Flickr. I practically live on pickled cukes in the summer. Only fresh tomatoes are better. Thanks for the recipes. I’ll definitely give them a try this week! Ooooh, those look tasty! I had an excellent cucumber salad when I was staying with a German family once. Still haven’t ever tried my hand at it myself, so maybe now is the timen to give it a go? At the bottom though, you’ve written that the Curry Rice Salad was adapted from two websites. Was one of them supposed to be for the Summer Noodle Salad? Thanks for sharing. We tried your mum’s cucumber salad yesterday and everyone enjoyed it. I think the other two are going to be great for packed lunches. I just tried the Summer Noodle Salad last night and it was quite yummy. I was going to note about the measurement for sugar, but I see someone else beat me to it. I used 1 tbsp instead and it turned out quite nice. Also, the cucumbers were quite good in it. The overall flavor reminded me me of Japanese hiyashi chuka. The salads look really great! Just the ticket for days when it is too hot to fire up an oven! Cool stuff! You should post your recipes in my Flickr group called “Make Me Hungry Vegies and Vegans”. You could win one of the weekly Golden Gnomes! Ok, I feel cooler just LOOKING at that cuke salad! These salads were so good!! I found them in b r o o k l y n t w e e d ‘ s flickr album and tried ’em out. 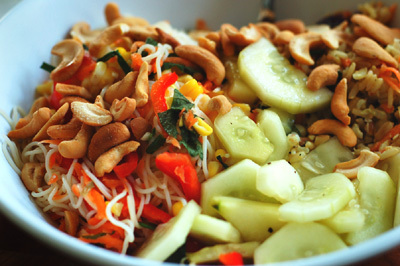 LOVE LOVE LOOOOOOVE the noodle salad! Thanks for sharing!